Winter has started here, but there will be no color change or falling leaves here in Houston. You can feel the winter by its cold. You can live here with a mild jacket, and not need layers of clothing. Forecasters are telling that this weekend is going to be chilly. When weather is chilly I love to heat up my oven and bake bread. I baked this bread pain au romarin (means rosemary bread) with my white sourdough starter, and I got the rosemary from the rosemary bush in my garden. The bread was delicious. Nowadays I love to try bread with sourdough, and also joined a Facebook group called Artisan bread bakers which helps me gain knowledge about baking breads a lot. This recipe I got from the monthly recipe challenge for November. 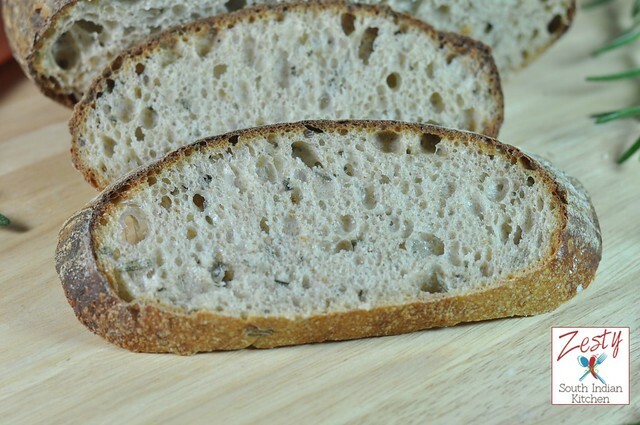 When I looked at the recipe it has bread flour, whole wheat flour and sourdough and rosemary. 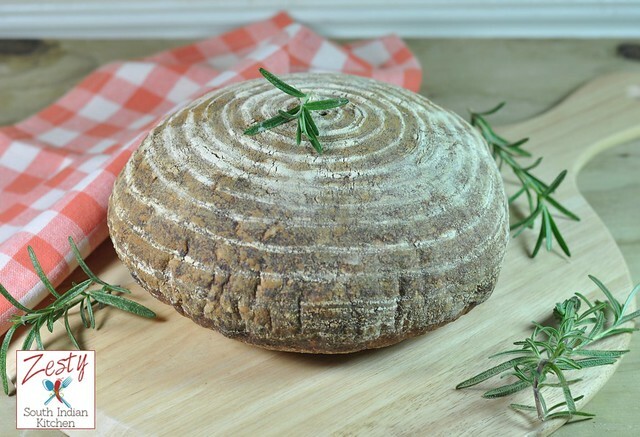 I love rosemary breads, so decide to try it immediately. Two days ago I tried to bake a batard of roasted apple bread. However while doing transfer of the proofed dough to pizza stone I end up tilting it and become bean shaped one. At first got upset then thought I will bake them anyway. Bread turned out to be delicious even with a look which I didn’t expect. I will try it again. If I make perfect bread every time then there is nothing to learn, isn’t it. So mistakes are good, occasionally reminding me that I still have a long way to go to master this art. This Pain Au Romarin is easy bread, makes leavin the day before baking and next morning add dough and freshly chopped rosemary. After folding few times, the dough is doubled in volume. And it is transferred to proofing basket and let it proof for another 2 hours. Recipe asked for baking it in a Dutch oven, but for a change I baked it in a pizza stone with steam. It is very nice bread. Give it a try rosemary added a nice twist to it. Here comes the recipe which is simple and straight forward, I halved the original recipe. 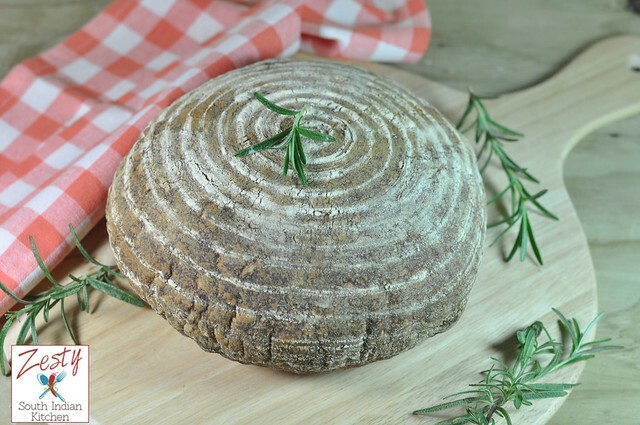 Delicious rosemary bread made with sourdough. Day before baking, combine all the ingredients for the levain in a plastic bowl and allow to ferment at 75 degrees for 8 hours. Next morning the leavin will look like this. On the day of baking add all the ingredients except salt for dough in a bowl and mix. Let it autolyse all of the ingredients minus the salt for thirty minutes. once a sticky shaggy mass is formed allow to rest at room temp covered. After autolyse add salt and rosemary. Knead this doguh for 6-10 minutes. DO NOT add any additional flour, this is a wet dough. Fold the dough in the bowl to prevent the addition of extra flour to this bread. Ferment at room temperature (75 degrees) for 2.5 hours with four fold in thirty minute intervals. and transfer to proofing basket. This dough can be proofed for two hours at room temperature in linen lined baskets or in the cooler for 12-15 hours. or until it is brown in color and it registers internal temperature of 200F. Cool the bread in rack for 1 hour inf you can and slice it. It is really excellent bread with rosemary . If you do proof in the cooler heavily flour your linen, rice flour will help to keep the dough from sticking to the basket. If you so choose, you can brush the remaining (extra) flour of the bread before baking with a pastry brush. You are a damn good baker, wish I can make any of this. Thanks Linsy . You too good cook you can try it. I wake up looking at your photos and I need to have one for breakfast. I t’s a perfect bread and I can imagine the rosmary flavor. Rosmary grows easily here in Mediterranean zone. You’re lucky because you’ve got in your garden. I’ll try to learn from your experience because, as you say, we learn every day, but is fantastic despite sometimes, the result is not good. Here, after a very hot October, autumn is colder but not chilly at all. Yes Marisa I have a rosemary bush in my garden which I planted last year. Sometime our experiment don’t work still we lean something form it. I like colder weather. Here temperature is going done still not so fast. Start baking Aara it is really fun. the bread looks absolutely perfect!! You really are a pro at baking. Every thought of having your own bakery? 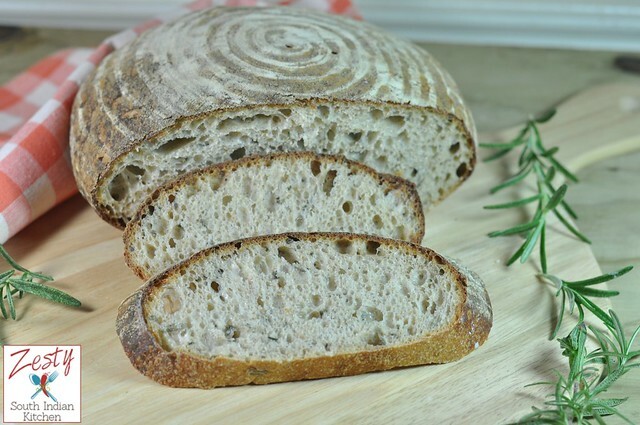 The moorish looks and the flavor of rosemary sounds so good in this perfect loaf. Keep it up dear. Thanks Taruna. I wish to have bakery sometime, may be a dream. Thanks Winnie, it is really delicious loaf. wow look like a professional artisan baker swathi.i cant able to eyes off from it. I haven’t made bread in forever! This looks so good! Wow…bread looks rustic and perfect!!! nice clicks..
You are so lucky to have a rosemary bush in your garden! I want too!! unfortunately I doubt rosemary would survive the monsoon here. Your pain looks perfect as it should be, great photo too, feel like having a slice asap. Thanks Helen, may be you can keep them in a pot. that way you can fresh rosemary there in India. yes it is delicious. looks like u loves bread..that too home mades..but its nice da…bcz they r healthy nfresh na.. I was about to ask you “How you got the circles in bread ?”,then i realized its from the pot its proofed ..Thats a yummy bake swathi. This bread is absolutely beautiful, Swathi! My son loves homemade bread and has chosen your loaf to feature at tonight’s party. Thank you for linking!